Buffalo is home to incredible people who are known for their affinity for traditions. From local festivals, cultural events, and festivities, Buffalo has a little something for everyone, particularly when it comes to food. This month, we sat down with our very own Kim Harrington, Sous Chef at Reikart House, to hear what she has to say about Buffalo's Easter traditions. Kim has always had an affinity for Easter. In her words, Easter signifies Spring; a chance at seeing the sun and green grass, fresh picked tulips, and fragrant purple Hyacinths. 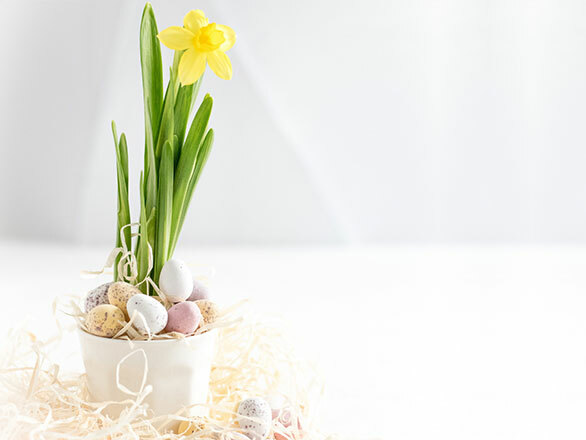 These things have always been the centerpiece of any spring table she has set, but if you've grown up in Western New York, you'll know no Easter table is complete without a Butter Lamb (a Polish tradition that signifies the "rebirth" after a cold and dormant Winter season). Kim also suggests featuring eggs with fun flavor combinations (think crisp bacon or a spin with Franks Hot Sauce), or even some candy (anything from Reese's Peanut Butter Eggs to Sponge Candy)! When asked what she recommends folks make for an Easter brunch, Kim says she always answers: "What one food made you smile and remember the best meal of your holiday in the past?" It could be something as simple as Easter Peeps to as complex as Gateau St. Honore' (a French puff pastry dessert combining pastry cream and Italian meringue). Whisk whole eggs, 2 cups milk, green onions, onion powder and talk together in a large bowl until well mixed. English muffins over the meat and top with remaining bacon. Pour egg mixture over casserole. Cover baking dish with plastic wrap and refrigerate overnight or for at least 3 hours in refrigerator day of. Sprinkle casserole with paprika and cover with aluminum foil. Bake in oven until eggs are nearly set, about 30 minutes. Remove foil. Continue baking until eggs are completely set, about 15 more minutes. Melt the butter slowly in a small pot. Try to not let it boil. You want moisture in the butter to remain there and not steam away. Blend egg yolks, lemon juice, salt until light in color. Add the egg yolks, lemon juice, salt and cayenne into a blender. Make it easy for yourself with this foolproof method. Blend the egg yolk mixture at a medium to medium high speed until it lightens in color, about 20-30 seconds. The friction generated by the blender blades will heat the yolks a bit. This will introduce air into them, making a lighter more delicate sauce. Lower the blender speed to low and slowly drizzle in melted butter. Continue to run blender on low until all butter is incorporated. Taste for seasoning and adjust if needed. If its not salty or lemony enough just add more salt or lemon juice to taste. If you want a thinner consistency, pulse in a little warm water. Store until needed in a warm spot, like on the stove or next to the stove top. Use within an hour or so. Drizzle Hollandaise sauce over Egg Benedict casserole and finish with a garnish of sliced green onions. Serve to your guests and enjoy their company. 12 slices homestyle white bread, you can use sourdough, brioche, whatever you enjoy. Cut into 1-inch cubes, divided into equal portions. Generously grease a 9x13 inch baking dish pan. Arrange half the cubed bread in the prepared baking dish. Evenly distribute the cream cheese cubes over the bread cube layer; sprinkle 1 ½ cups sliced strawberries atop cream cheese layer. Layer the remaining bread cubes over the strawberry layer. Pour half and half into a blender, pulse for a few seconds. Blend eggs into half and half until fully incorporated. Add maple syrup and blend until smooth. Pour mixture evenly over bread mixture. Cover the baking dish with foil and refrigerate 8 hours or overnight. Bake the covered casserole in the preheated oven for 30 minutes. Remove foil and continue baking until French Toast is puffed and golden brown, about 30 more minutes. Stir, sugar, water, and cornstarch together in a small saucepan. Cook, stirring occasionally, over medium heat until mixture thickens, about 5 minutes. Mix in 1 cup sliced strawberries, cook and stir until strawberries have softened, about 10 minutes. Add butter, stir until melted. 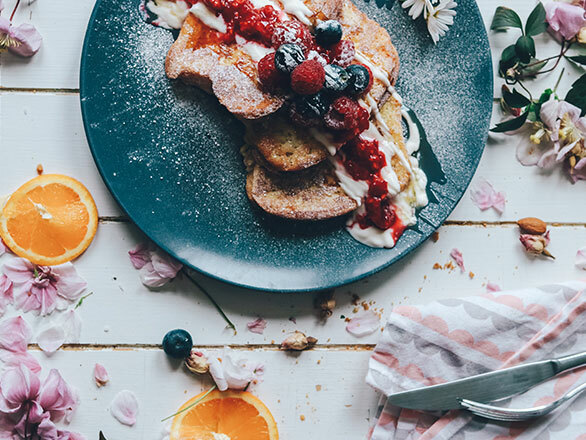 Serve hot fresh berry sauce over French Toast. If you desire, put a dusting of powdered sugar just before serving to your guests. From our kitchen to yours! This Easter, host a fabulous brunch at home with recipes brought to you by the Reikart House Sous Chef, Kim Harrington. Her easy to follow recipes will have you spending more time with your guests and enjoying those cherished family traditions. Still not sure you can be your own master chef? Let us show you a venue for inspired celebrations, where you and your guests can expect the unexpected. Book your next event with us and prepare to be wowed.